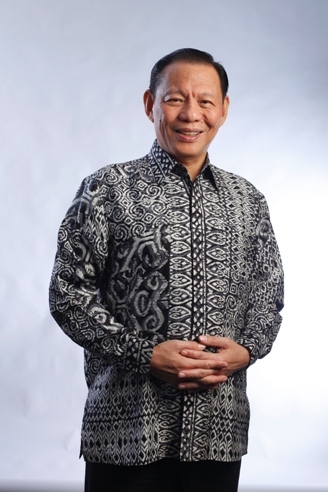 An entrepreneur, visionary and pioneer of a number of industries in Indonesia, Sukanto Tanoto is the Founder and Chairman of RGE (Royal Golden Eagle), a global group of resources-based companies. He established RGE (formerly known as RGM) in 1973. He set up RGM to enter the plywood business, transforming Indonesia from an exporter of raw materials (logs) to a value-added processor. From its humble beginnings in Medan, Indonesia, RGE has grown to be a global business that employs 60,000 people, have assets of more than US$18 billion and with manufacturing operations in Indonesia, China and Brazil and sales worldwide. This growth is driven by the leadership of Sukanto Tanoto and his belief that a company can only be successful if it is a responsible corporate citizen. Hence, RGE’s guiding philosophy is based on the Triple Bottom Line approach of People, Planet and Profit, which means RGE operations must be "good for the community, good for the country, good for the climate, good for the customer and good for the company". As such, all RGE-managed business groups operate on the basis of sustainable growth in every sector and operation. They aim to achieve efficient production with excellent quality, energy savings and operate harmoniously with the environment. Sustainable growth means integrating new technology, fresh ideas, environmental protection and social responsibility into all RGE operations to ensure long-term economic success. It also means having world-class human resources led by a management team working together in a dynamic, multi-cultural and global environment. Building on the strong foundations, all business groups within RGE continue to leverage their skills and resources to consolidate leading positions in the world’s most exciting markets – within a framework of strong corporate governance. RGE believes that good corporate governance is essential for a company to be successful and sustainable. Each of RGE’s business groups operates independently with its own holding company, governed by a board of directors, and with management overseeing operations and strategy. Objective decision-making and accountability underpin all our businesses. These qualities ensure a high level of professionalism and integrity across RGE. RGE's vision is to be one of the largest, best managed and most sustainable resource-based groups, creating value for the community, country, climate, customer and company. Sukanto Tanoto is also active in Corporate Social Responsibility (CSR) and Philanthropy. RGE business groups have a long-term commitment to be part of the communities’ economic and social fabric, hence they know the importance to have a direct, lasting impact on the socio-economic wellbeing of those who live within their areas of operations. RGE business groups establish partnerships with local villagers, providing them with farming skills, vocational training and economic assistance. While offering work opportunities, the programs also encourage them to start their own businesses, significantly improving their standard of living. Through his Tanoto Foundation, Sukanto Tanoto supports a broad range of social causes. Together with his wife, Tinah Bingei Tanoto, Sukanto Tanoto works hard to address important issues facing individuals who live in communities that are underserved. In particular, the Tanoto Foundation has set out to reduce hardship and break the cycle of intergenerational poverty through education and empowerment programs. This is Sukanto Tanoto's story.